As distributed via press release on Sept 11, 2018. 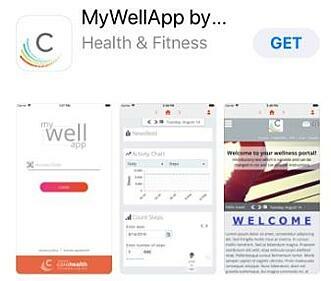 Kelowna, BC and the United States – September 11, 2018 – CoreHealth Technologies announces the release of a new mobile app called MyWellApp, now available for download on the Apple App Store and Google Play, to inspire and engage participants in corporate wellness programs. MyWellApp is a replacement of the original app called CoreHealth Mobile and showcases the complete functionality of CoreHealth’s corporate wellness platform. Wellness program participants will be able to access and engage with health assessments, challenges, events, health content, video coaching, watch videos and collaborate with other program participants in a fun and intuitive format. CoreHealth’s wellness portals have always been optimized to support a fully responsive design on any screen size but now, customers can enjoy the best of both worlds with the fully responsive native app, available in multiple languages on Apple and Android phones. With today’s mobile culture, apps are one of the best ways to increase employee wellness program participation and to make programs accessible for employees and their dependents in every corner of the globe. With MyWellApp the look and feel of the app completely matches the full portal experience with extensive customization and branding options. “Our team at CoreHealth Technologies has worked hard to continually evolve our corporate wellness technology to readily respond to customer demands. MyWellApp is a powerful tool that can help keep employees informed, inspired and engaged. With the MyWellApp, our customers now have an additional tool to boost wellness program participation by utilizing the convenience of mobile devices.” said Anne Marie Kirby, Founder and CEO of CoreHealth Technologies. For participants to use the MyWellApp, they still require registration through their employer as the app is a component of their workplace wellness program. CoreHealth’s wellness platform is used by leading global providers including corporate wellness companies, insurers and their wellness divisions, health coaching companies, employee assistance program providers, group benefits brokers, human resources consulting firms and health systems to develop, deliver and analyze wellness programs for employer clients. CoreHealth Technologies Inc. is the leading corporate wellness platform trusted by wellness providers for 2+ million employees worldwide. At CoreHealth, we believe that developing the best employee wellness programs is all about giving wellness companies the right code, design and access to the latest innovations. With the most customization, integrations and reliability of any software in its class, CoreHealth’s powerful platform lets users focus on growing great companies. For more information, visit the CoreHealth website.